Shoot the first bird high and drop the egg in the middle of the ramp to kill the four surrounding pigs. 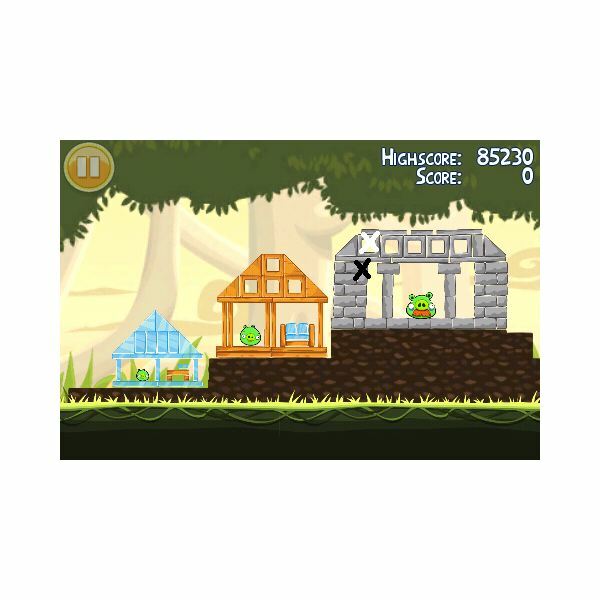 The next bird should be aimed to hit the corner of the next structure, pushing it over and killing the remaining pigs. 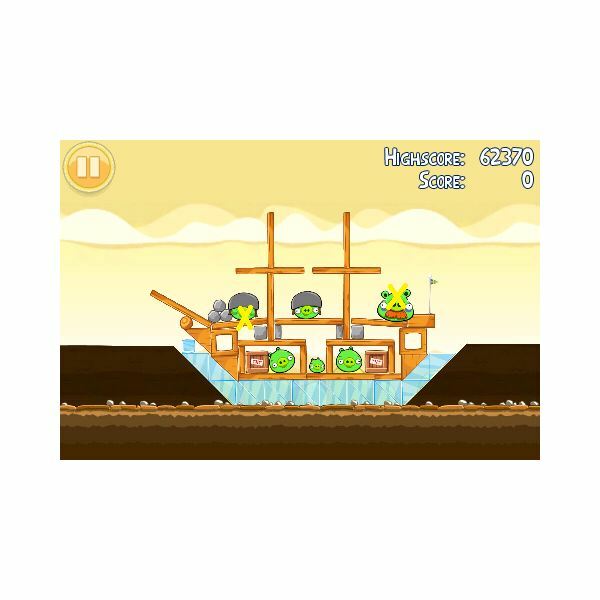 This may take time to perfect, you need to aim the first bird high, tapping the screen almost immediately and the middle bird should land on the largest pig, the other birds will then start to roll or be hit, each pig will be killed. Aim the first bird over the first structure and into the next. 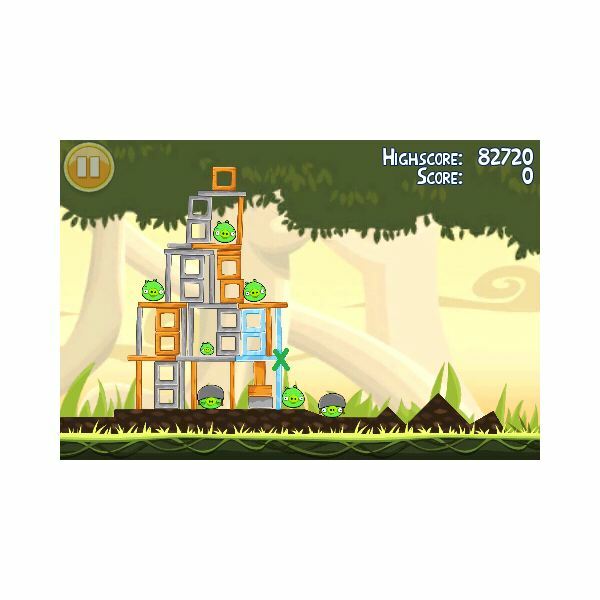 Before it hits tap the screen and the bird will hit with force collapsing the structure. The second bird should be aimed at, and hit, the corner of the first structure, pushing everything to hit the TNT and blowing up the last pigs. 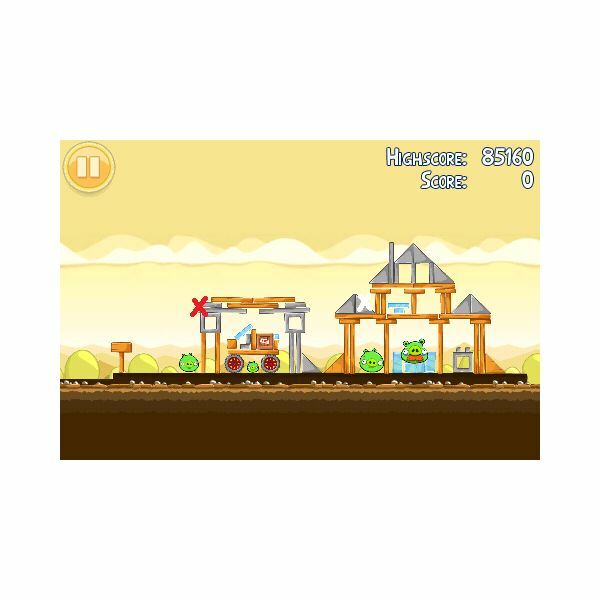 Aim the first bird high and over the structure to hit head on the pig just next to it, when it begins its descent tap the screen and the flying birds should kill the pig they're aiming for as well as the one next to it. Aim the second bird for the block next to what looks like a wheel to collapse part of the structure. Aim the next bird in the same path which should then go through to kill the pig in the middle, collapsing the structure and killing the rest of the pigs. The first bird should be shot high, as though it will fall on to the two pigs resting under the plank. Once it almost hits, tap the screen to drop the egg and it will crash into the building killing the closest four pigs. Aim the next bird to fly directly into the remaining structure which will push it to the side killing the rest of the pigs. 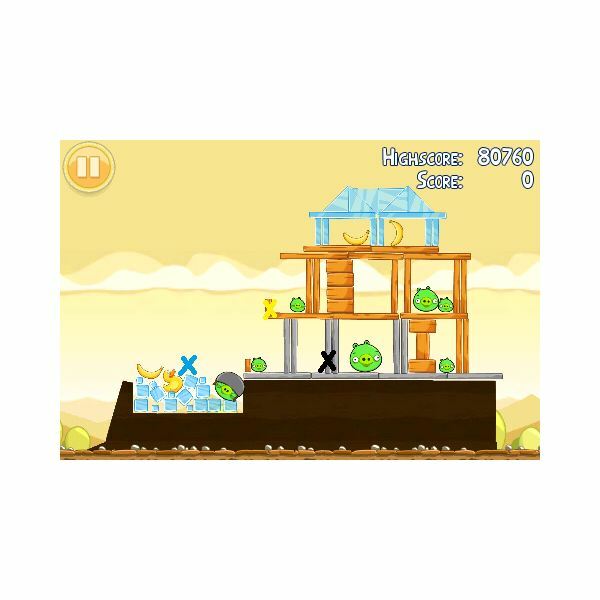 Aim the blue bird to land in the middle of the blue dip, tapping the screen as it gets close which will kill the first two pigs. The second bird should be aimed for the small wooden block resting on the structure to kill the closest pig and collapse part of the structure. With the last bird, keep it low to hit the structure at the ground level to blow it up and kill any last pigs. 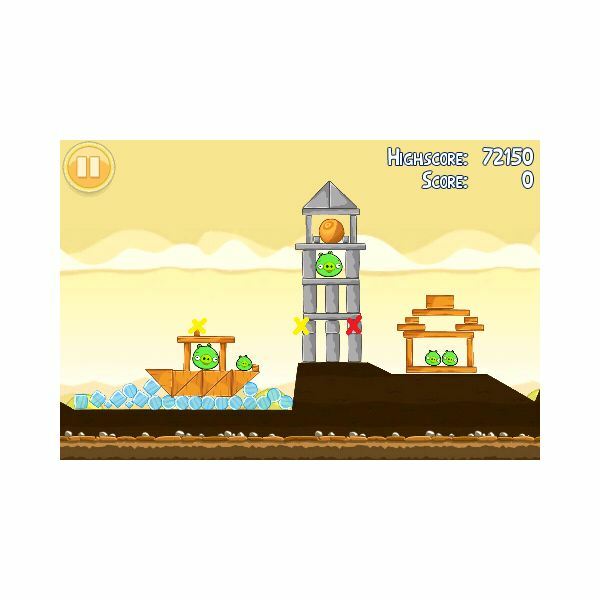 Aim the first two birds at the small grey square on the structure, the first will hit the top of the boat and the second should be shot directly in order for the tower to fall and kill the first three pigs. The last bird should be shot low to hit the last square standing next to the wooden structure for it to collapse killing the last pigs. 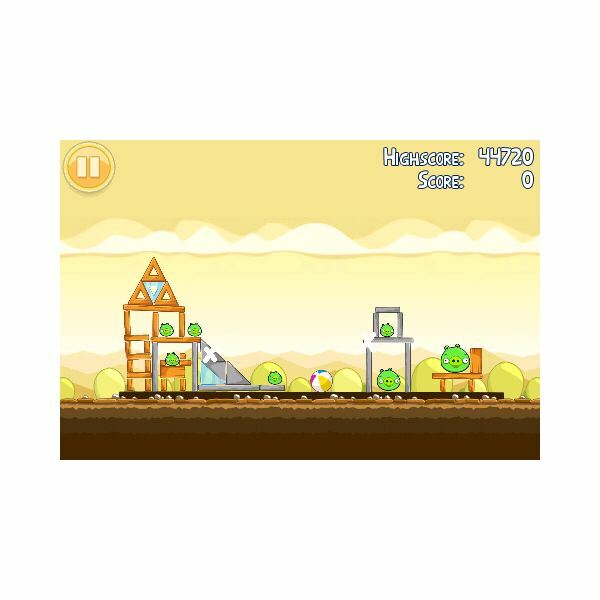 Shoot the first bird high into the air to hit and kill the furthest pig. Following in the same path, shoot the second bird to detonate the TNT box and kill more pigs. 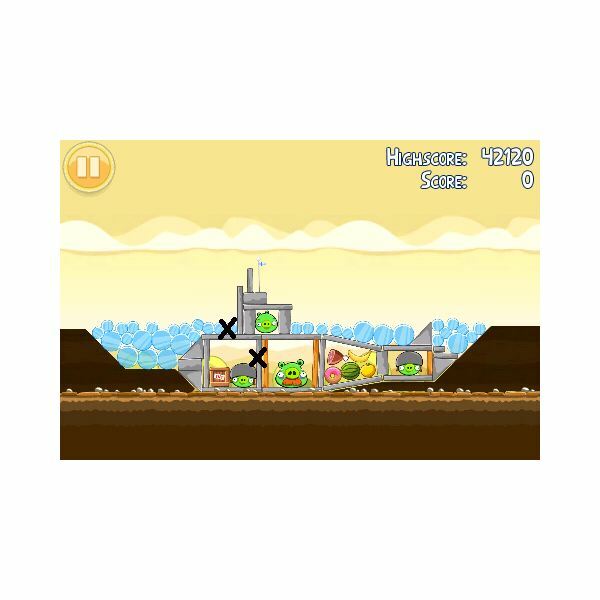 The last bird should be shot high again, to hit the closest pig and tap the screen to speed it up so it will go through to detonate the second TNT box, blowing up the last pigs. Aim the first bird straight on to hit the grey square at the top of the small structure to collapse it. 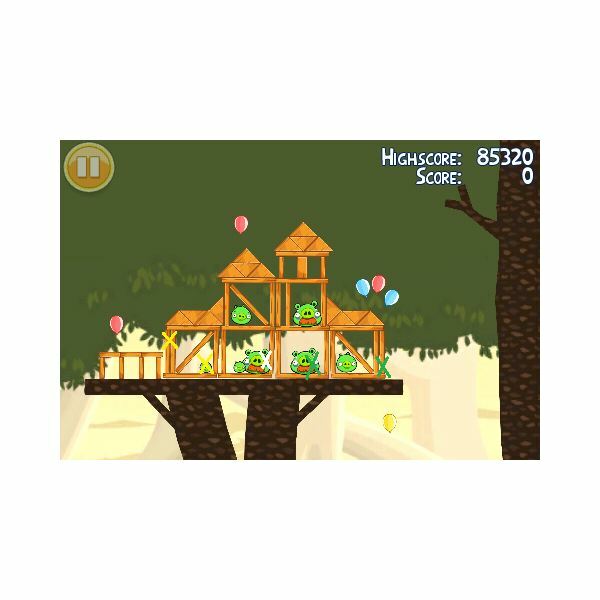 Aim the second bird high to hit the left ledge of the second structure and tap the screen on its descent to demolish it along with the pigs. Aim the first bird for the largest pig, when it gets close tap the screen and the flying birds should kill all but one pig. The second bird can then be aimed low to hit the silver triangle and the impact should kill the last pig. The first bird should be used to break the vertical beam on the second structure, leaving the wooden square next to the TNT box vulnerable. Aim the second bird for the square which will detonate the TNT box killing all but one pig. The last bird should be shot directly at the pig remaining. 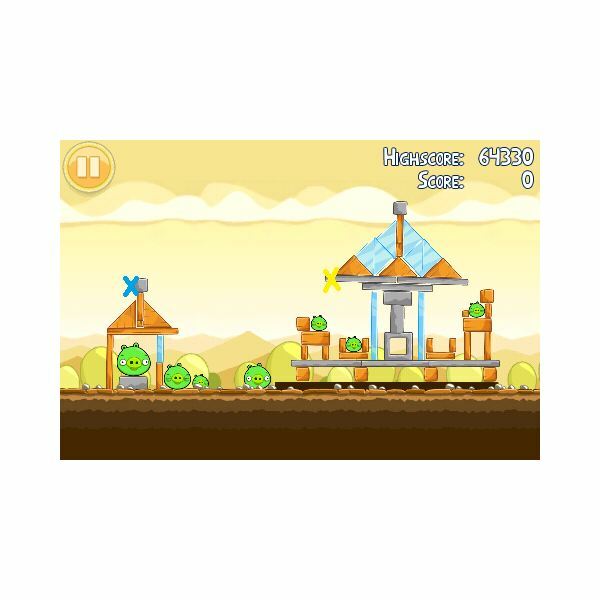 For Angry Birds help with getting 3 stars on theme 5-12 to 5-20 go to page 2. Shoot the first bird straight into the pole to kill the first pig. The next bird can be shot in the same path to break the wooden beam, sending the wheels of the front structure rolling and killing the pig inside. The final bird can now be shot high to land through the blocks housing the TNT blocks to kill the final pigs. Shoot the first bird straight ahead to blow up, detonating the TNT box and killing the pig next to it. The next bird can be shot in the same path, it should go down the gap the first created. This will explode killing the remaining pigs. 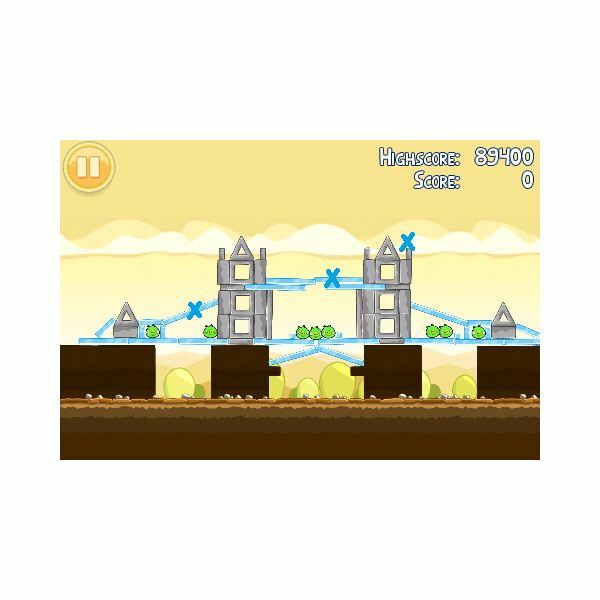 Aim the first bird straight ahead as if to crash into the second silver square, just as it's about to hit, tap the screen to drop the egg and it should leave a beam of wood exposed. The second bird should be shot low and directly to the exposed wood, hitting the TNT box and killing all of the pigs in one go. The first bird should be shot into the wood block under the beam sticking out of the structure, killing the top two pigs. Aim the next bird into the same path and tap to increase speed. The third bird should be shot high into the air to fall on the uppermost pig. And finally the last bird should be shot again in the same path to kill the final pig. Shoot the first bird at an even angle to land on the corner of the second step up causing the rocks to be thrown killing three pigs. 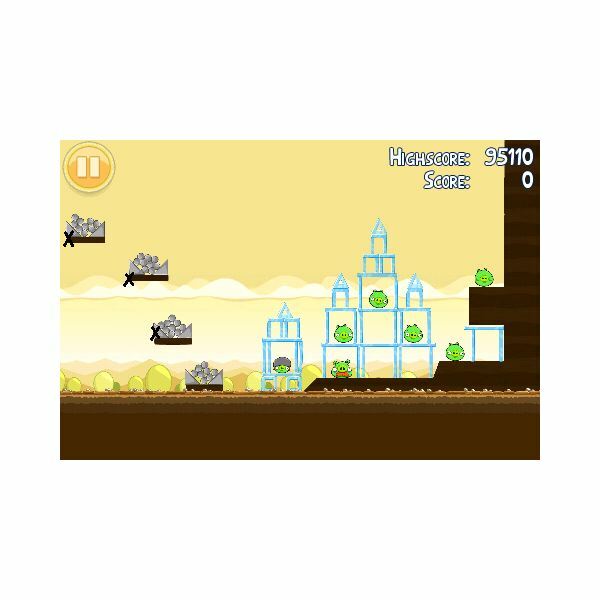 Aim the next higher to hit the side of the next shelf up and tap the screen to detonate when it hits, the rocks will again be flung into the air and kill a further two pigs. To kill the final pigs do the same with the next shelf up. Shooting the first bird high it should hit the beam housing the first pig, killing it and shooting through the beams and collapsing part of the structure. Shooting the next bird in the same path, this will plough through more of the beams. The third bird should again be shot in the same path to kill another pig. Following the same path again, shoot the next bird to collapse the structure and kill all but one pig. 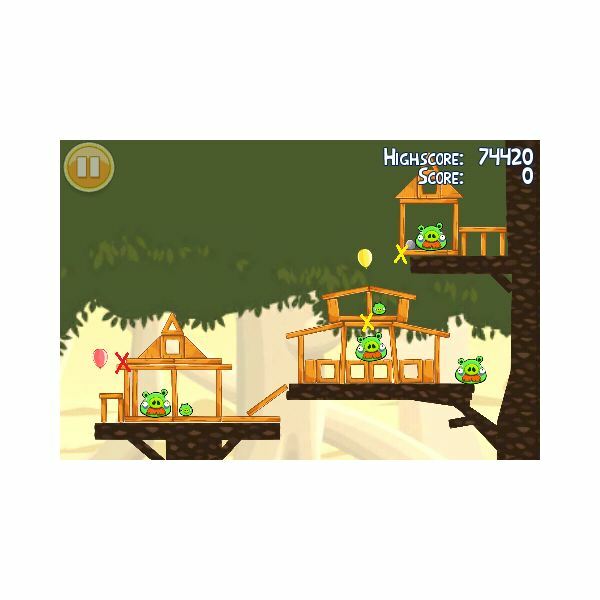 The last bird, aiming slightly further, should shoot through the final beams to kill the last pig. Aim the first bird quite low to fly over the first step and into the second step up, as it's about to crash drop the egg and the bird will crash into the structure killing four pigs. The next bird should be shot to the exposed wooden beam, shooting through it. 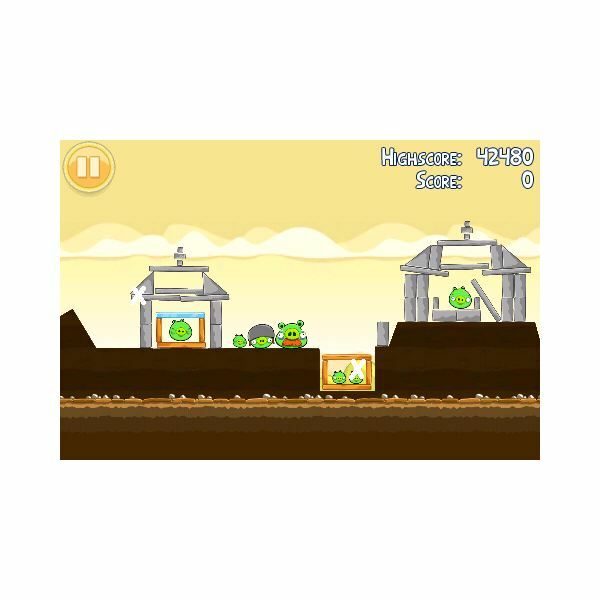 Shoot the next bird through the wooden beam above the two pigs which will explode, killing every pig left. 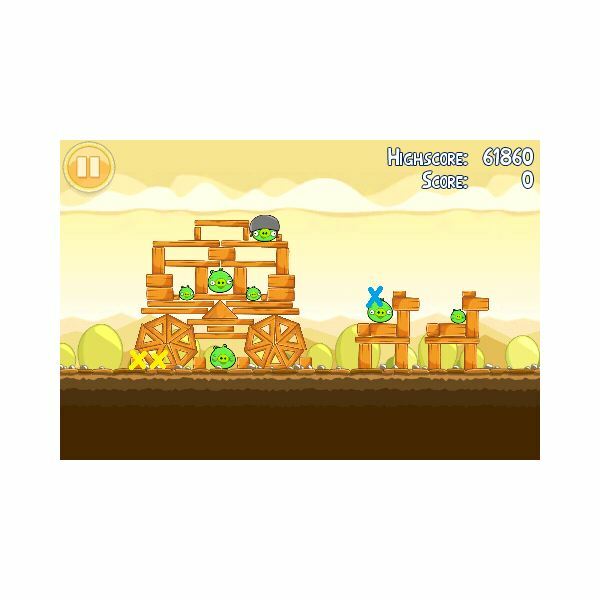 Shoot the first bird over the first structure to hit the vertical wooden beams and tap for extra force and this will destroy the beams leaving the wooden block to the TNT boxes exposed. 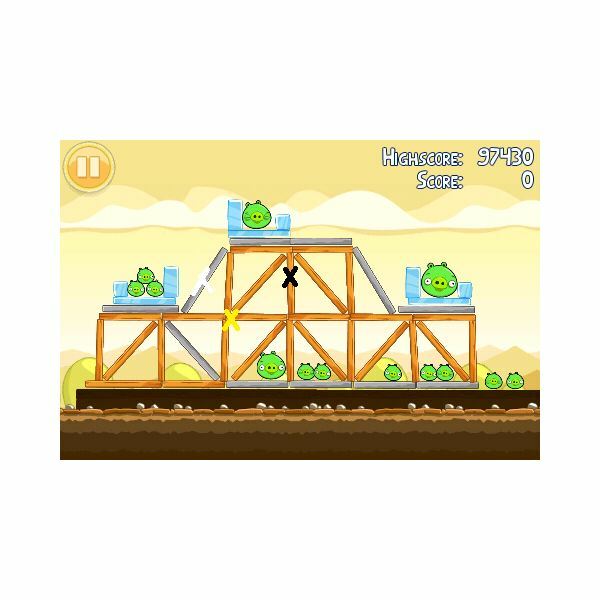 Fly the next bird over the structure again and drop the egg on the wooden block to detonate the TNT boxes, blowing up the pigs. 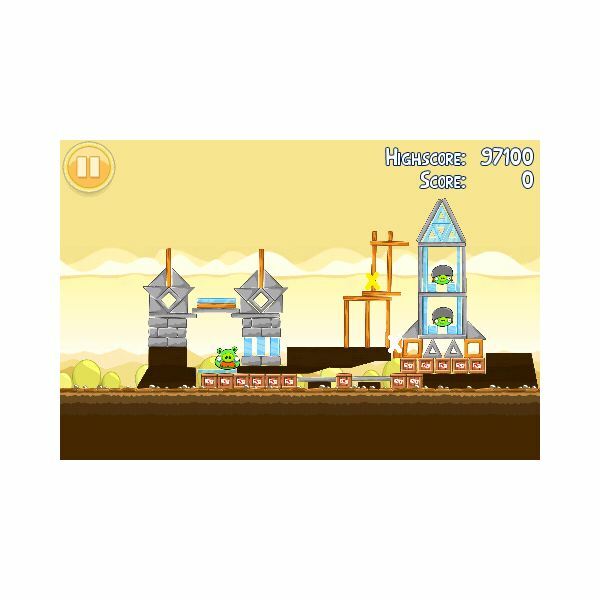 Aim the first bird high over the first tower aiming for it to hit the right side of the blue planks and tap the screen which should catch the stone tower bringing it down, with the force bringing down the tower to its left and killing all of the pigs housed in the middle of both towers. The second bird should be shot a little further, it should clip what is left of the right tower to bring the debris down on to the blue planks, killing the two pigs housed on it. The last bird should be shot very high, to fall on the nearest blue planks, killing the final two pigs. 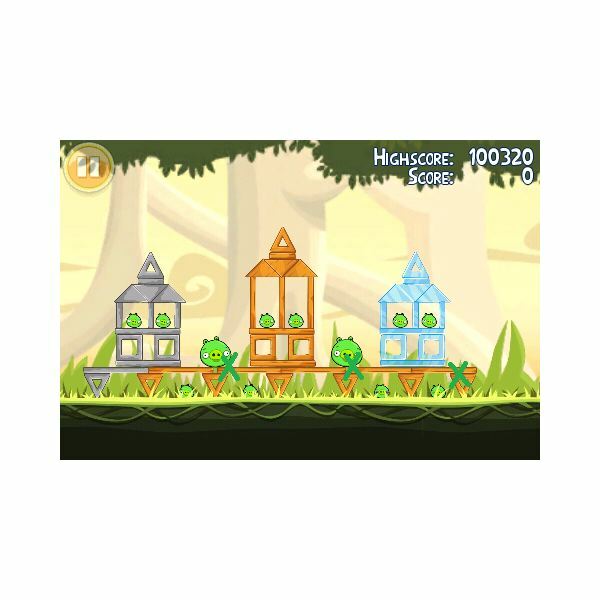 For Angry Birds help with theme 5-21 to 6-8 go to page 3. Shooting almost straight ahead, the first bird should be shot to hit the wall just past the shelf like plank to blow the structure killing the first eight pigs. 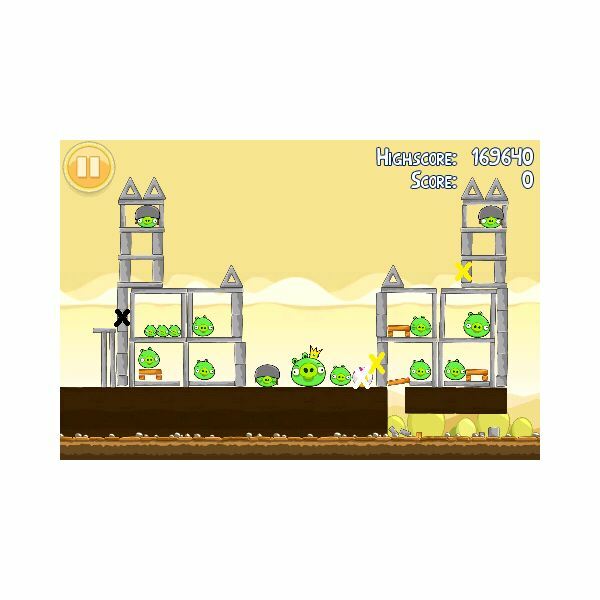 The second bird should be shot wide to hit the wall of the opposite tower to knock it over and kill the three pigs housed in it. The next should be aimed for where the blocks meet next to the beach ball to kill the top pig. 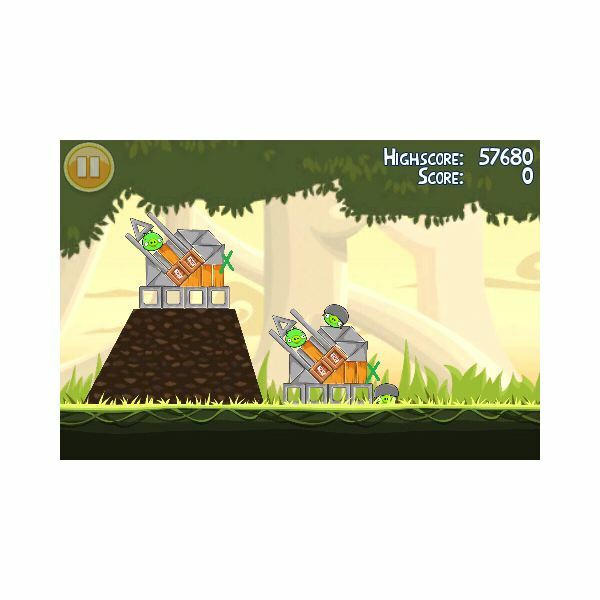 In the same path aim the last bird to hit the same place, as it is about to hit tap the screen for the bird to be forced into the structure, killing the last pigs. Aim the first bird for the divider in the tall part of the structure which will cause the bird to roll to the left killing each pig in its path. The next bird should go in the same path to hit the same target which will destroy the structure, the resulting debris will then kill the remaining pigs. The first bird should be aimed high to hit the left side of the sloped top of the structure to weaken it. The next bird should be shot high again to hit the opposite side of the structure, just above the TNT boxes to detonate them and kill every pig inside. To kill the first two pigs, aim the first bird low to hit the corner of the blue structure in the shape of an arrow. The next bird should be aimed to just fall short of the grey structure to drop the egg to kill the large pig. This will send the bird into the structure, knocking it down and killing the remaining pigs. Aim the first bird for the support block which will break and collapse the side of the structure. Now aim the next bird for the top exposed TNT box to detonate them and set off the others around the structure, killing each pig inside. This level will no doubt take some practice to get right. It can be done with just one bird which is set off not too high, but high enough to go over the structure comfortably and tap to turn it around when it gets just clear of the leaves in the background. It will then hit the structure directly on the small gap where the beams meet and tumble everything, setting the debris to kill each pig in turn. Aim the first bird to go comfortably over the structures and when it comes past the leaves in the background tap the screen to send it flying into the wooden blocks of the second structure, killing the three pigs in and around it. Aim again for the wooden blocks of the first structure for the impact to kill the pig inside. Aim the first bird to hit the bottom support plank on the far side to knock it out completely. 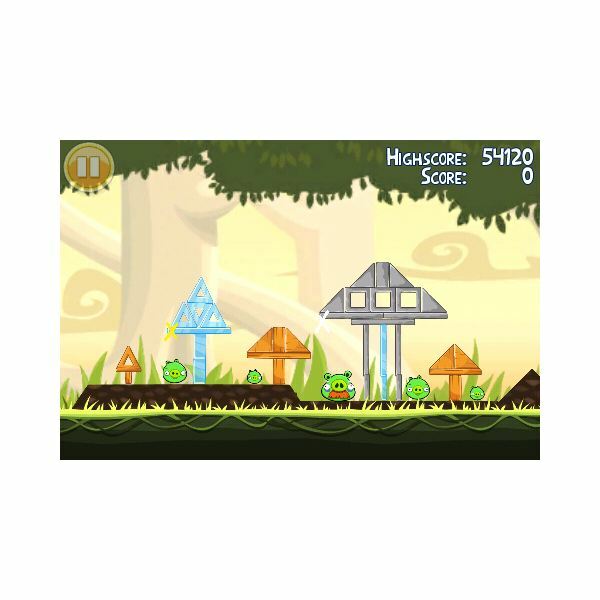 Follow the second bird in the same path, tap the screen a little earlier and it should hit the corner of the structure which is now not supported following the first attack. This will now collapse the right part of the structure killing three pigs. The last bird should be aimed for the bottom horizontal support plank to the bottom left of the structure to collapse everything and kill the last pigs. To kill the closest four pigs, aim the first bird high to fall in the first dip in the structure and wait for it to blow up. Aim the next bird for the left side of the tower where the remaining pigs are to kill all but the one on the end. The next bird will not fly the distance to kill the last bird so fly it over the debris to drop the egg where it will make the most damage for extra points. 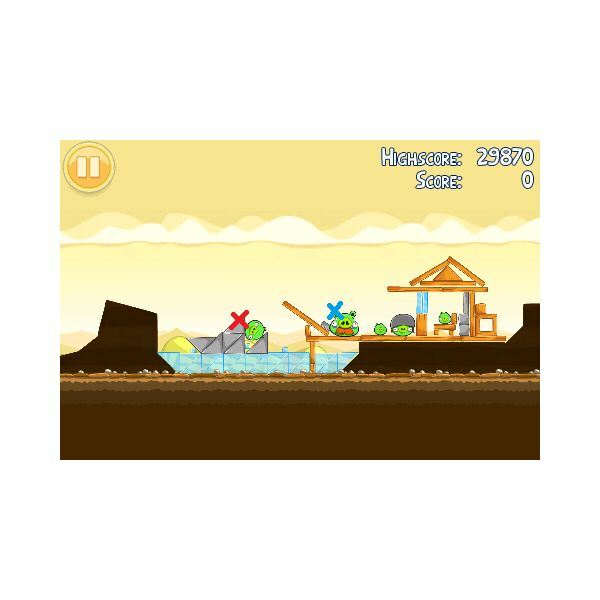 Aim the last bird far to hit the rubble as close to the pig as possible and it should blow up pushing the pig over and killing it. 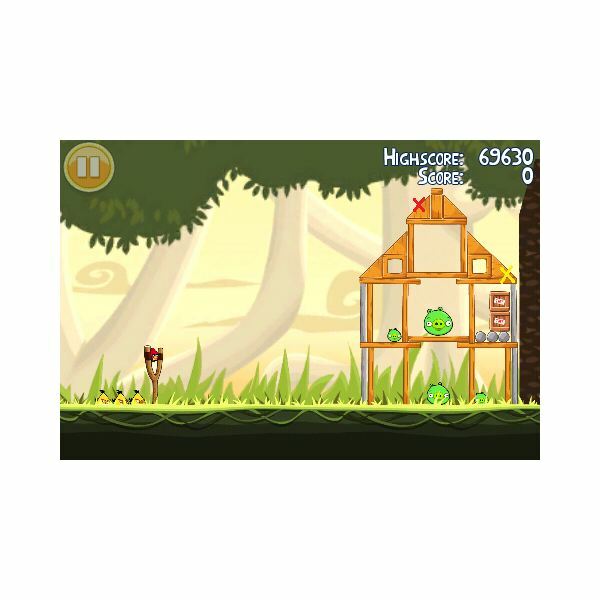 For Angry Birds help with theme 6-9 to 6-15 go to page 4. Aim the first bird for the second square up to demolish the first layer of protective bricks. Once the first layer is gone aim the second bird a little higher to sail through the third square up, this will cause the structure to collapse, TNT boxes to explode and kill every pig. Aim the first bird high to fall to the top of the furthest structure and just before it touches drop the egg. 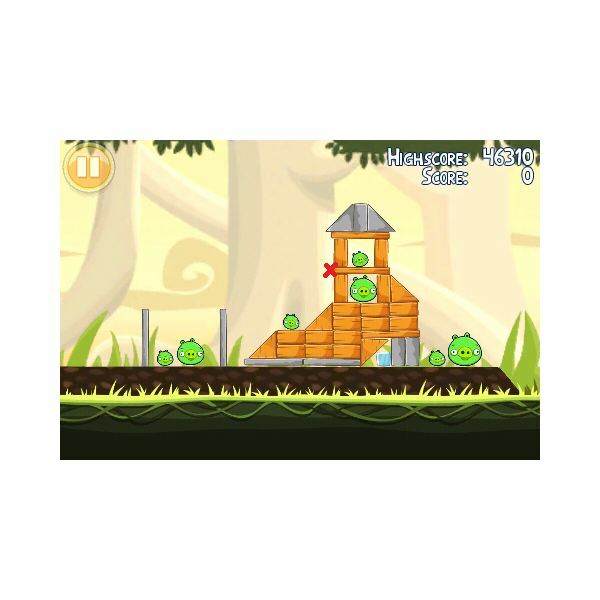 Use the second bird to follow the same path and the resulting blast should blow up the grey structure, pushing over the other two and killing the pigs in the process. 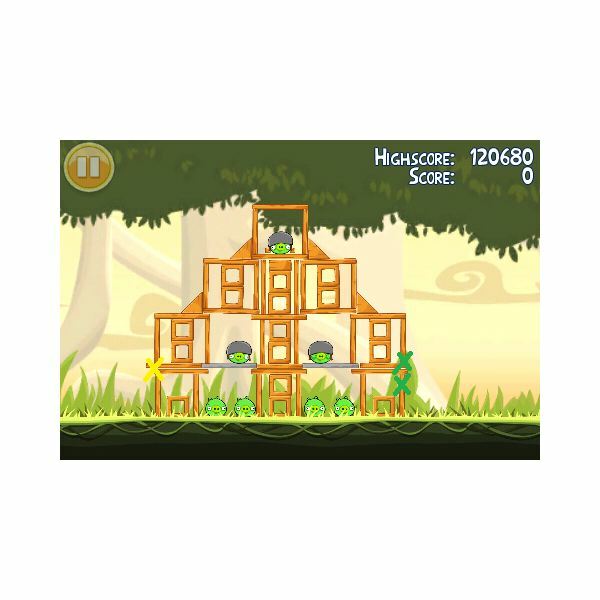 The first bird should be aimed to just go over the structure and tap the screen as it descends past the green leaves in the background for it to turn around to hit the spot where the three blue planks meet. This will collapse the entire structure killing every pig. 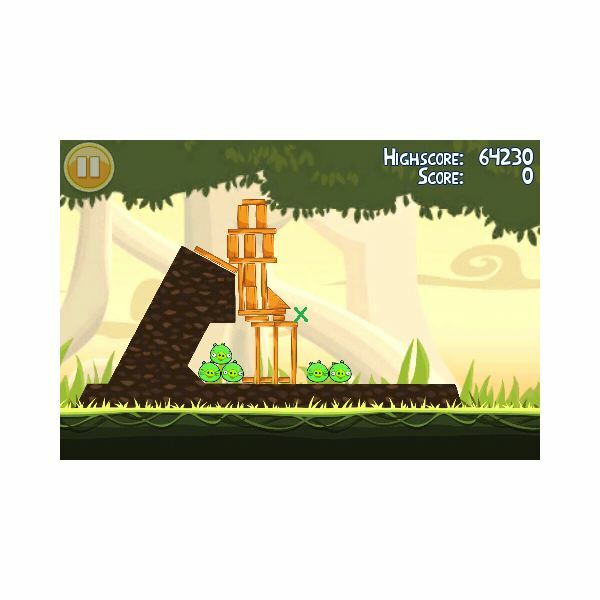 Aim the first bird high into the air and as it falls tap the screen to turn it. It should hit the end of the wooden floor to topple the first tower and kill the first three pigs. Aiming higher, the second bird should be aimed to hit the plank on which the furthest bird rests at ground level to kill a further four pigs. Aim the first bird down, for the corner of the structure below to collapse it and kill the pigs inside. Aim the next bird for the overhanging corner of the uppermost structure to kill the pig inside and drop the debris and rock which will fall to kill the vulnerable pigs below. The last bird should be used to fly high and land with extra speed on top of the last pig. 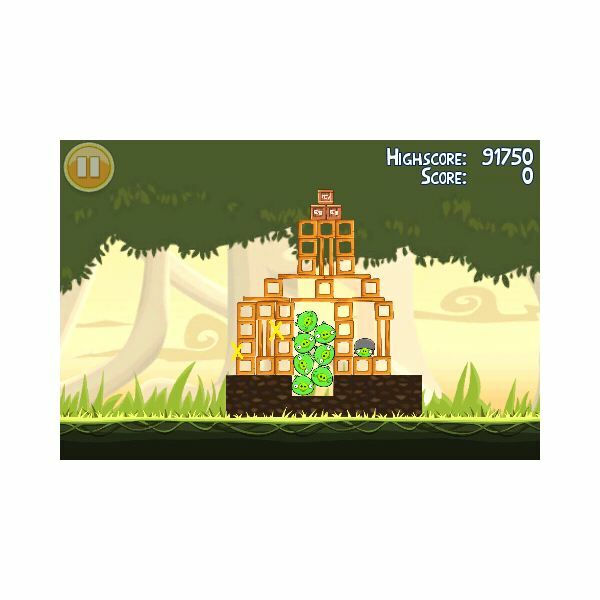 The first bird should be aimed to pass just over the structure and tap the screen for it to fall and hit the bottom of the opposite side. The next bird should be aimed to go through the small gap on the left of the structure to begin to collapse it. 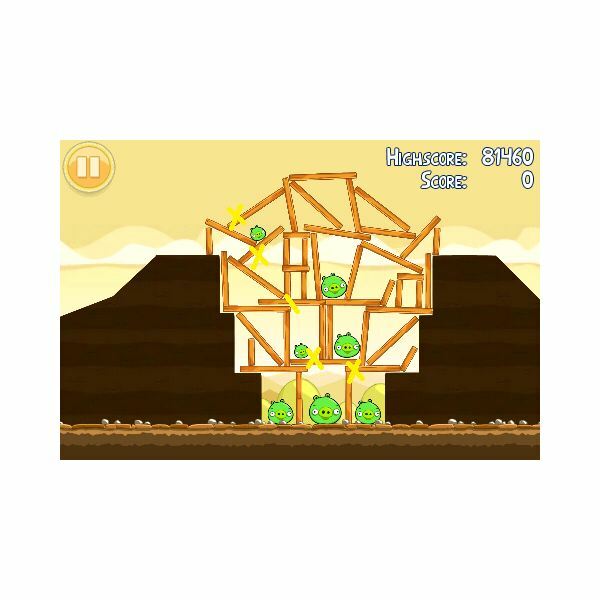 Send the next bird in the same path to cut through the supporting planks and collapse the structure and kill the pigs inside leaving four remaining. Using the next bird, aim for it to hit the closest pig and just before it hits drop the egg and the bird will help to collapse the rest of the structure. Aiming in the same path as before send the last bird which will kill the remaining pigs. Aim the first bird in a low path to skim and kill the lower two pigs hanging by balloons and come to rest on the bottom corner of the large structure to kill all but the larger pig on that level. The second bird should be shot higher in a path to hit the first two hanging pigs and land on the smaller structure which will fall on to the pig left below. 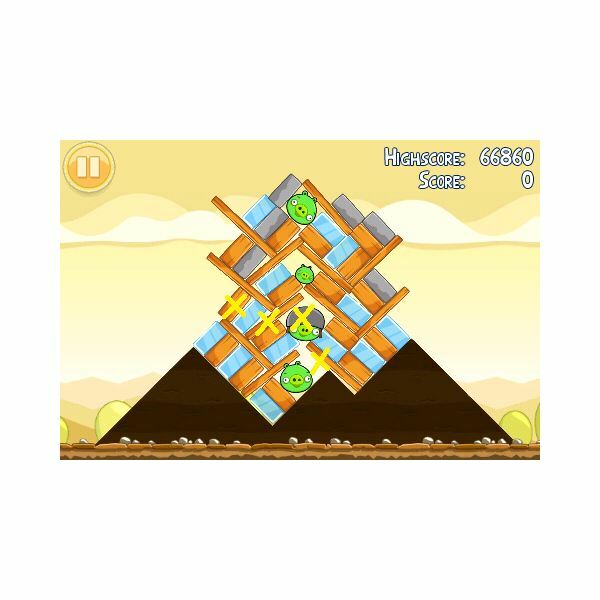 In a slightly higher path launch the next bird to demolish the rest of the smaller structure and kill the pig hidden behind it. Here's the clever part, shooting the next bird in the same path as the last, it will fly lower than the last which is what we want. 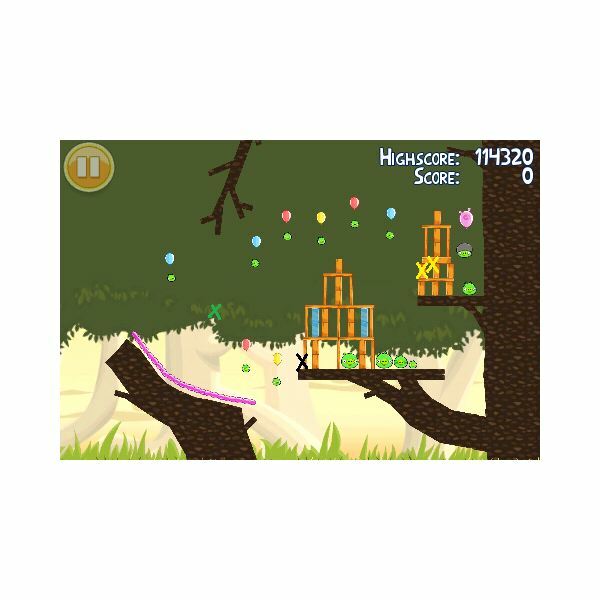 When it reaches the dip up in the leaves in the background, tap the screen and it will turn, hit the pink layer and be shot up to hit the remaining pigs in turn. This does take practice so don't worry if you don't get it first time. For more 3 Star Rating Walkthrough for Angry Birds Themes and Levels see our series below. 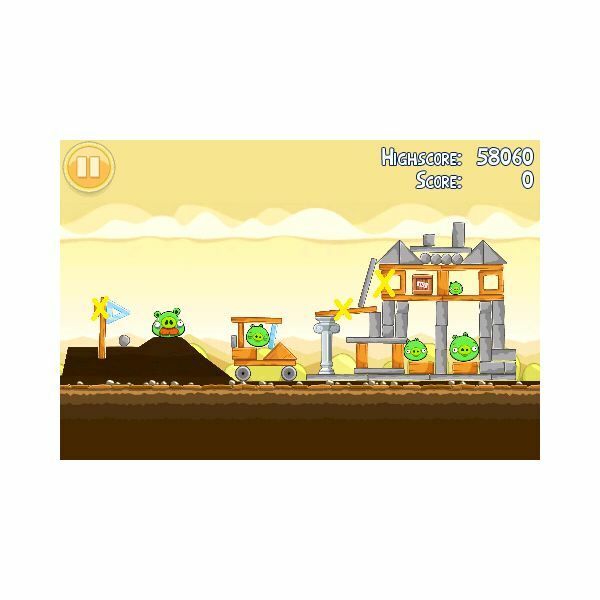 All screenshots and references from Angry Birds for iPhone. With Angry Birds being one of the most popular game apps so far, here is your complete walkthrough to guide you through each theme and level with a 3 star rating.